Appreciative Inquiry is a philosophy and a methodology for positive change. It is founded on the simple assumption that human systems – teams, organizations and people – move in the direction of what they study, what they focus upon and what they talk about with regularity. The essence of Appreciative Inquiry is then the study of what “gives life,” energy and vitality to organizations, teams and people when they are at their best. Appreciative Inquiry does not assume that any person or organization is always at its best. It does posit, and both research and experience show, that people learn, and organizations change most readily when they focus on, study, and engage in dialogue about strengths, patterns of success and who they are at their best. For this reason, the Appreciative Inquiry process engages large numbers of people in dialogue and deliberations about their individual and collective strengths, their hopes and dreams for the future, as well as opportunities and plans for collaborative action. 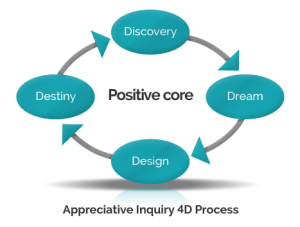 The process generally follows the Appreciative Inquiry 4-D Process: Discovery, Dream, Design and Destiny (Figure below). People individually and collectively have unique gifts, skills and contributions to bring to life. Organizations and communities are sources of unlimited relational capacity, created and lived in language. The images we hold of the future are socially created and, once articulated, serve to guide individual and collective actions. Through human communication (inquiry and dialogue) people can shift their attention and action away from problem analysis to lift up worthy ideals and productive possibilities for the future. In short, Appreciative Inquiry suggests that human organizing and change, at its best, is a relational process of inquiry, focused on “what we want to realize” and grounded in affirmation and appreciation of what works well – the “positive core” of strengths.